Finally all the features of the 1911-8 with smaller price tag. 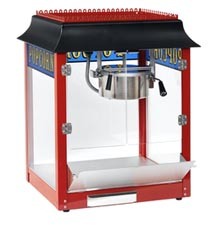 This new six ounce "Turn-of-the-Century" styled popcorn machine will deliver 113oz/hr of popcorn. With the standard lower deck warming element, this popper will keep your popped popcorn warm all day. The "old maids" tray will help reduce the unpopped kernels for easy clean up.